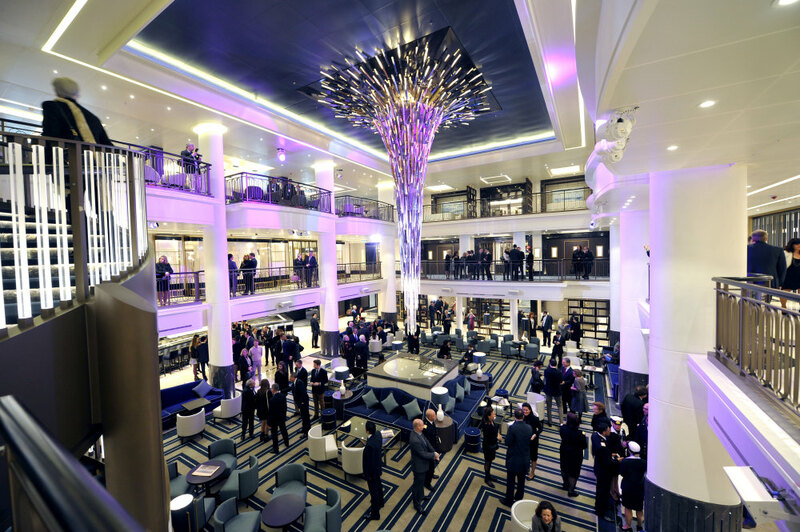 P&O Cruises officially took delivery of Britannia on Sunday 22 February 2015 during a ceremony that took place at the Fincantieri shipyard in Trieste, Italy. The video features shots of inside the ship as well as segments from the handover ceremony. During his speech David Dingle, executive chairman of Carnival UK, said “Britannia will soon be ruling the waves again”. English singer Jaki Graham, who had a hit single along with David Grant with “Could It Be I’m Falling in Love” in 1985, took to the stage to perform at the event. Food celebrities Olly Smith, Eric Lanlard and Charlie Turnbull were also on-board and offered their thoughts. Pâtissier Eric Lanlard claimed his signature afternoon tea experience – which will take place in the Epicurean restaurant – is fully booked for the first few sailings. He also said the restaurant looked very stylish and it looked like a Michelin Star room. Wine expert Olly Smith described Britannia as “like a five star hotel with an echo of the past”. Christopher Edgington, Marketing Director for P&O Cruises also claimed “Britannia‘s the fastest selling cruise ship in history”.